Wow!! The crazy busy CMJ week is finally behind us, which resulted in piles of dirty laundry around the house, empty fridge with a box of baking soda mischievously staring at you and a layer of city dust evenly covering surface of your entire apartment. But despite a minor disturbance of my house routine, I had an absolutely fantastic time catching some inspiring performances and meeting new people from all over! Light-Minutes Away had a fantastic showcase at Matchless!! All the bands, the audience, the venue and the sound collaborated on an absolutely new level - it was an all-embracing experience!!!! Letters to Nepal Releases New Dance Single "Think About It"
Letters to Nepal, a Brooklyn-based ambient-pop band known for its atmospheric progressive synths and serene vocals, is stepping outside of its common sound with its new indie dance tune Think About It. Starting with the dreamy soundscape, it may fool you into thinking you are about to be carried away by another meditative composition of Letters to Nepal. But instead, as the intro fades away, it prompts you to dance and doesn't let go until the very last chord. Check for yourself! 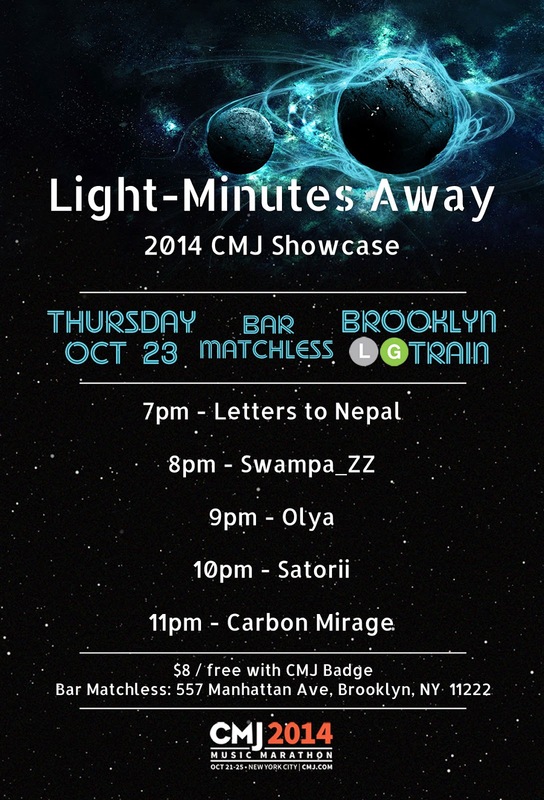 Letters to Nepal will be playing a CMJ show as a part of Light-Minutes Away Showcase on October 23 at Bar Matchless. October is here, and the CMJ madness is approaching faster than we think! Our line-up is looking fantabulous!! October 23rd at Bar Matchless, doors open at 6:30pm!!! !